A brilliant and unsettling play from one of the UK's leading dramatists. Premiered at the Royal Court Theatre in 2000. At the opening of the play, a young girl is questioning her aunt about having seen her uncle hitting people with an iron bar; by the end, several years later, the whole world is at war - including birds and animals. 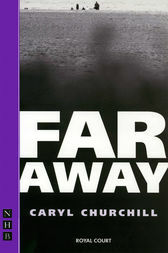 Far Away is a howl of anguish at the increasing – and increasingly accepted – levels of inhumanity in a world seemingly perpetually involved in conflict.